A high school student in Nebraska tries to bluff his way through a French assignment; a Voodoo Priestess tries to help the New Orleans Saints get to the Superbowl; and a man starts to believe his psychiatrist is a real flirt. A high school student attempts to pass an Ionesco play off as his own. A man starts to believe his psychiatrist is a real flirt. 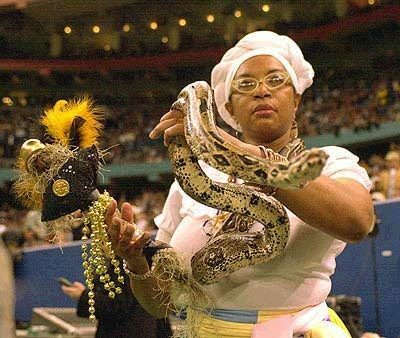 Ava and her snake at the Superdome. Photo courtesy Ava Kay Jones.